« Mirror, Mirror on the Wall, Which Country Has the Most Expensive Bureaucrats of All? Question of the Week: What’s My Take on “Reform Conservatism”? Underlying this school of thought is the notion that the Reagan-era message no longer works since Republicans have lost the popular vote in five out of the last six elections. A few people have asked my opinion about this movement, and since Ross Douthat of the New York Times just put together a good description of this school of thought, it makes it easy for me to offer my thoughts. But before digging into his column, I think that some of the angst on the right is misplaced. Why blame a Reagan-era message for GOP electoral problems when all the Republicans presidential nominees in recent years have favored big government? Does anybody really think that Bush 41, Dole, Bush 43, McCain, and Romney were Reaganites?!? Could any of those candidates have given these remarks, at least with any credibility? Or made these comments in a sincere fashion? It’s much more plausible to say that Republicans have lagged because they didn’t have candidates with a Reagan-style message. But let’s assume, for the sake of argument, that Republicans would have fared poorly even if Reaganites had been nominated. Does “reform conservatism” offer a path to electoral salvation. Here’s what Douthat identifies as the “two major premises” of reform conservatism. I’m not an expert on income mobility, so I’m not sure I would identify stratification and stagnation as the nation’s core economic challenge, but he may be right. Regardless, it’s definitely a good idea to have more mobility. And I definitely agree that the welfare state hinders upward mobility by creating dependency. And he’s right that this is a drag on growth. That being said, I disagree with his assertion that rising entitlement expenditures crowd out other spending and lead to middle class tax hikes. Those things may happen at some point, particularly once we get into the peak years for retiring baby boomers, but they haven’t happened yet. The more important question, at least to me, is what sort of policies do reform conservatives embrace? Here’s Douthat’s list, bolded, followed by my thoughts. a. A tax reform that caps deductions and lowers rates, but also reduces the burden on working parents and the lower middle class, whether through an expanded child tax credit or some other means of reducing payroll tax liability. I obviously like the idea of lowering rates and reducing deductions since that moves the system closer to a flat tax. 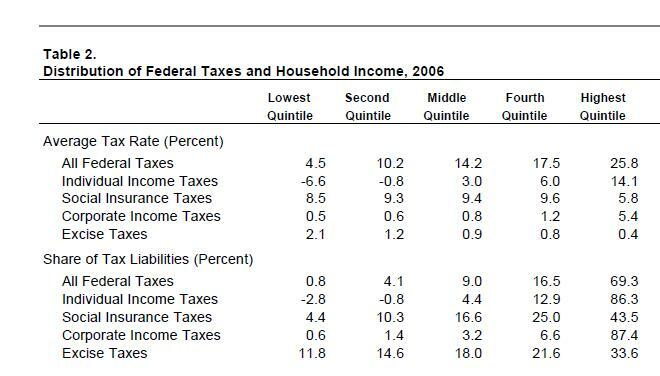 That being said, it’s difficult to reduce the tax burden on the lower middle class since they pay very little income tax under the current system (see accompanying table from CBO). But I like the idea of addressing the payroll tax, though I disagree with their approach (see section “c” below). b. A repeal or revision of Obamacare that aims to ease us toward a system of near-universal catastrophic health insurance, and includes some kind of flat tax credit or voucher explicitly designed for that purpose. I fully agree with repeal of Obamacare, and I think an unfettered marketplace would evolve into a system of near-universal catastrophic insurance, but I don’t want the federal government subsidizing or coercing that approach (though current healthcare policy has far more subsidies and coercion, so Douthat’s plan would be a big improvement over the status quo). c. A Medicare reform along the lines of the Wyden-Ryan premium support proposal, and a Social Security reform focused on means testing and extending work lives rather than a renewed push for private accounts. I’m glad they embrace Medicare reform, but I’m puzzled by the hostility to personal retirement accounts. If you increase the retirement age and/or means test, you force people to pay more and get less, yet Social Security already is a bad deal for younger workers. So why make it worse? How can that be good for those with low mobility? Personal accounts would be akin to a tax cut for such workers since the payroll tax would be transformed into something much closer to deferred compensation. d. An immigration reform that tilts much more toward Canadian-style recruitment of high-skilled workers, and that doesn’t necessarily seek to accelerate the pace of low-skilled immigration. As I noted in this interview, I very much favor bringing more high-skilled people into the country. e. A “market monetarist” monetary policy as an alternative both to further fiscal stimulus and to the tight money/fiscal austerity combination advanced by many Republicans today. I try to avoid monetary policy. That being said, I’m a bit skeptical of “market monetarism.” No nation has ever tried this system, so it’s uncharted territory, and I’m reluctant to embrace an approach which is premised on the notion that bubbles can’t exist (what about the tech bubble of the late 1990s or the housing bubble last decade?!?). I’m also suspicious of a system which requires an activist central bank. Watch this George Selgin video if you want to know why. f. An attack not only on explicit subsidies for powerful incumbents (farm subsidies, etc.) but also other protections and implicit guarantees, in arenas ranging from copyright law to the problem of “Too Big To Fail.” Amen. I fully agree. Since I’m a tax policy wonk, let me address in greater detail some of the tax reform proposals put forward by reform conservatives. Jim Pethokoukis of the American Enterprise Institute is identified in the column as a reform conservative, and he recently expressed skepticism about the flat tax in a column for National Review. It’s an elegant, compelling model that might work splendidly if you were creating a tax code ex nihilo. …America, however, is in a much different place. Millions of individuals and businesses have made long-term plans based on expectations that the tax code will remain more or less the same. Half the nation, thanks to all those deductions and credits, pays no income tax. …it’s unlikely the U.S. can keep spending down at historical levels of 20 percent to 21 percent of GDP while also maintaining a floor for defense spending at 4 percent of output. The best a group of AEI scholars could manage was limiting spending to 23 percent of GDP by 2035. The clear implication of his column is that we need a tax system that raises more revenue. I obviously disagree. We should never “feed the beast” by giving politicians more money to spend. Pethokoukis also says the flat tax is politically unrealistic. Since I’m not expecting a flat tax in my lifetime, I obviously can’t argue with that statement. But he then proposes another plan that would be far less popular – and far more dangerous. One solution is to take the essentially flat consumption tax devised by economists Robert Hall and Alvin Rabushka and give it a progressive rate structure. Or we could combine a consumption tax with a flat income tax on wealthier Americans, as suggested by Yale’s Michael Graetz. So we should keep the income tax as a vehicle for class warfare and augment it with a VAT?!? Yeah, good luck trying to sell that idea. And Heaven help us if it ever succeeded since politicians would have another major source of tax revenue. Another plan, which Douthat explicitly cites in his paper, was put together by Robert Stein, a former Bush Treasury official. He thinks traditional supply-side policies today are either irrelevant or unpopular. Lowering tax rates today could still enhance the incentives to invest, particularly in the corporate sector. But the distortions caused by marginal tax rates are not nearly as great as they were in 1980. And attempts to solve other problems caused by the tax code itself — like the biases in favor of consumption over saving, or home building over business investment — could never in themselves garner the public support necessary for a major overhaul. As I noted, I’m not holding my breath for a flat tax, so I can’t disagree with Stein’s prognostication. He also has a very novel way of defining the problem we should be trying to fix. …it is time to rethink how the tax code treats ­parents. …raising children is hardly just another pastime: It is one of the most important services any American can perform for our country. …even as Social Security and Medicare depend on large numbers of future workers, they have created an enormous fiscal bias against procreation, undermining an important motive for raising children: to safeguard against poverty in old age. ……our system of taxes and entitlements not only fails to reward parents — it actively discourages Americans from having children. …Recent studies (especially work by Michele Boldrin, ­Mariacristina De Nardi, and Larry Jones and by Isaac Ehrlich and Jinyoung Kim) show that Social Security and Medicare actually reduce the fertility rate by about 0.5 children per woman. In European countries, where retirement systems are larger, the effect is closer to one child per woman. As a libertarian, the beginning section of that passage grated on me. My children are individuals, not a “service” to prop up entitlement programs. I agree with Stein that these programs are a problem, but the solution is to reform entitlements, not to rejigger the tax code in hopes of pumping out more taxpayers. Unfortunately, these negative effects on fertility cannot be cured simply by converting old-age entitlement programs into mandatory savings programs, as the Bush administration proposed for Social Security in 2005. After all, requiring workers to save for retirement through private financial instruments would also crowd out the traditional motive to raise kids. Instead, he wants to change the tax system based on the notion that today’s kids are tomorrow’s taxpayers. I have no philosophical objection to some form of exemption – or even credit – based on family size. Almost all flat tax systems, for instance, have some sort of family allowance. But it’s also important to realize that bigger family allowances generally don’t have pro-growth effects. It’s the marginal tax rate that impacts incentives. And Stein, unfortunately, would “pay” for his credits by raising marginal tax rates on a significant share of taxpayers. Some of these costs would be offset by eliminating itemized deductions (other than mortgage interest and charitable contributions). The rest would have to be offset by ­allowing the top rate of 35% to touch more taxpayers than it currently affects. …who pays more? Primarily high-income workers, but also upper-middle-class taxpayers who do not have children in the home (either because they have decided not to raise children at all, or because their children have already turned 18). To be blunt, the plan is a tax hike on the rich and makes the tax code even more progressive than it is today. To be fair, Stein also proposes some good policies such as AMT repeal and reductions in double taxation, so he’s definitely not in the Obama class-warfare camp. But it’s also fair to say that his plan won’t do much for growth. Some tax rates are lowered but others are increased. Yet if you really want families to be in stronger shape, more growth is the only long-run solution. Moreover, it’s not clear that Stein’s agenda would be terribly popular. Though I confess that’s just a guess since no politician has latched onto the idea in the years since the proposal was unveiled. Returning to the broader issue of “reform conservatism,” it’s difficult to assign an overall grade to the movement since I’m not sure whether we’re supposed to interpret it as a political strategy or an economic plan. Regardless, I guess I’m generally sympathetic. I assume the RCers want government to be smaller than it is today and I don’t think you have to be a 100 percent libertarian to be my ally in the fight to restrain excessive government. And I also think it’s a good idea for people to be thinking of how to best articulate a message of smaller government. Heck, I do that every time I go on TV or give a speech. So I reserve the right to object to any of the specific proposals that reform conservatives put forward (such as the tax plans discussed above), but I like the project. One more comment- Rep-ublicans actually WON elections when they ran on a platform of fiscal conservatism. Recall the elections of 2010, and before that, the one of 1994 when Gingrich made his “contract with America”. I realize this writing focuses on taxation, and the issues thereof. However, I do believe that simply working on the tax side of the equation will not improve ANYTHING. We MUST decrease the regulatory burden, or the best tax code in the world will not save our country. Today, it would be almost impossible for Henry Ford to start up a similar enterprise as he started so many decades ago. The regulatory hurdles are simply too high. Heck, he could afford the taxes if he could just get past that big mountain of regulations. Recall that in his time, we had tax burdens on the wealthy as high as 80%- they were just not further encumbered with the regulations we have today. V-Max, I tend to agree. None of the Republican presidential candidates ran on a campaign of reducing the size of government or even restraining it. Mostly, they have argued to spend money differently OR for tax cuts with no significant spending reductions. it’s just a different brand of lipstick… on the same old ugly pig…. the sad truth is there is no difference between a big government tax and spend democrat and a big government tax and spend republican… “reform conservatism” is little more than squishy spots in the bull pasture… republicans have lost the popular vote in five out of the last six elections because they have run losers… people who are out of touch reality and lack the capacity to empathize with voters… they have been plagued by bad strategies… stupid gaffs… and a lack of vision… America is changing… and the republicans don’t seem to have a clue……….. wasn’t it “compassionate conservatism” last time?